Coming face to face with a wasp and you're probably going to back away to avoid a painful sting. You can probably relax when it comes to the ichneumon wasp, though. A few species will lash out if mishandled, but a typical ichneumon is only interested if you’re an appropriate host for her eggs -- and humans aren’t her targeted species. Instead, various insect larvae show up on her parasitic radar as good places to plant a family, and her choice of habitat often relies on the abundance of her favorite bugs. Due to an estimated 40,000 to 100,000 species and a worldwide presence, identifying a member of the ichneumon family is sometimes difficult. They're related to wasps and bees and have long, segmented antennae that can reach half the length of the body, which narrows significantly at the thorax. An ichneumon has two membranous, transparent wings. Body colors vary greatly and may include black, brown or tan with shades of yellow or red markings. Sizes range from 1/8-inch to an impressive 5 inches overall. Females have a tube at the end of the abdomen that resembles a stinger, but it’s actually an ovipositor -- a long conduit used to deposit eggs. 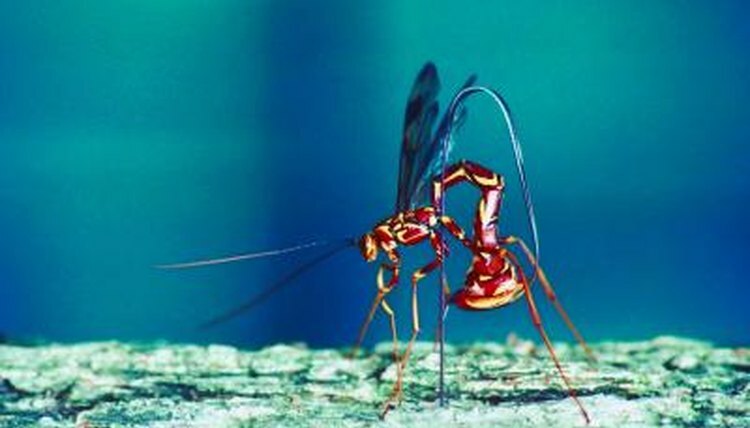 Preferring damp to dry and woodsy to open plains or arid conditions, 3,000 or more species of ichneumon wasps consider the United States home. Despite their numbers, however, many humans will never see an ichneumon wasp other than via a chance encounter under a glowing porch light one warm evening. Adult ichneumon drink nectar from flowers if they eat at all. The larvae are the true consumers. All ichneumon wasps are parasites who deposit their eggs on or near the young of other insects and spiders. Once the eggs hatch, they feed on the unsuspecting host larvae until reaching the dormant pupate stage. Each species of ichneumon larvae has a taste for a particular type of insect, and many have developed skills to reach even the most elusive prey. The giant ichneumon (megarhyssa sp.) has an ovipositor that is approximately 3 inches long, which she inserts through decaying tree trunks to reach the horntail larvae residing within that her young feed on. Another variety of ichneumon wasp spends much of her life near small ponds or lakes and has learned to dive in order to deposit her eggs into the underwater larval sacs of caddis flies. Many other insects, spiders and birds rely on the abundant ichneumon population as a nutritional additive or mainstay of their daily diet. Humans also benefit from the parasitic nature of the ichneumon wasp. Serving as natural pest control for some potentially harmful insect populations (such as boll weevils and asparagus bugs) which may deplete valuable crops if left unchecked, the ichneumon wasps indirectly contribute to a successful economy.